Cooler Master’s Master series of products certainly carry a unique sense of style and value. While its public perception still remains to be one that’s drastically confusing for a wide range of its audience – largely due to the unconventional naming scheme and over-familiarity between each and every product – claiming to deliver the same if not similar features – the Master series clearly contains an incredible line-up of products. While it could benefit from a serious improvement, one that would provide a better sense of direction and understanding for its catalogue of products – especially within the peripherals and chassis segments – the appealing nature of a product launch is always one that we hope to be creative and just’ – visually distinct and a step above prior products. When the MasterKeys Lite L first arrived at my desk, my initial thoughts towards the keyboard were mixed to say the least – swaying towards negativity with a positive sense of curiosity. While I may not be of the all-so popular mindset that RGB back-lighting will save us all, and redeem us of our sins towards towards frying graphics cards and building PCs on a carpet, I do appreciate the subtle-dim lights of a pale-blue glow beneath my mechanical switches. For those who do admire the disco lighting of everything which envelopes modern PC gaming technology, they’re in for some good news! The MasterKeys Lite L incorporates a six zone lighting system with a full suite of wave, ripple, breathing and strobing – customizable through speed and personal patterns to tweak to your heart’s content. While I will admit that this feature looks quite impressive in-action, whether it’s day-to-day usage or its long hours of gaming, RGB lighting becomes somewhat of an intrusion – a distraction if you will due to the lack of innovation and creativity which has plagued this section of the industry for a great number of years. RGB backlighting looks great at press events and trade-shows, but ten minutes into practical-use and I begin to form a million and one ideas as to how the keyboard could have been improved, outside of looking like a Power Rangers accessory for ten-year old boys and overly-determined collectors. None of this is by any means a kick towards the quality or styling of the keyboard itself, simply an observation of what it presents and whether or not it’s distinguishable against competing products. One thing which cannot be underestimated with the MasterKeys is the premium construction and build quality. Make no mistake, no corners were cut, no hedges unevenly trimmed – this is a fine piece of kit. Indicated by its weight and thickness, as well as the attention to detail within the structure of its visual design, everything from the Mate Black finish with its brush stroke appearance to the rounded-edges of its solid one-piece exterior is stylish and prime. Giving the keys themselves a zero-G look as they present themselves to be floating atop of the backlit plate with an arched styling for natural presses – the high-perched look of the keycaps do well to deceive their non-mechanical functionality. In order to improve the durability and ease-of-use – as well as cutting down on price – Cooler Master has taken the functional traits of a mechanical switch and combined it with that of standard membrane key as a means to create something quite interesting. Where these news keys allow Cherry MX keycaps to be compatible for the purposes of styling, the additional support and housing of the tactile inducing components do well to work alongside the strengthened plunger to increase the strength and lifespan of the tactile dome foundation. Without a doubt, the feeling of a standard mechanical keyboard is evident, as to whether or not it may actually have the long-term durability of one remains to be questioned. Since this feature delivers on the feel of a mechanical switch – partly doing away with the negative stigma surrounding rubber-dome keyboards – long term use of this keyboard for me is one I’ll continue with. Fitting in with my millennial lifestyle of incalculable cups of coffee – with the occasional fruit juice for a false sense of health benefits – the keyboard has proven to be well equipped to deal with such spills. Water Splash Resistant as promised the keyboard is easy to clean from both crumbs and liquids. Along with multimedia control by the use of FN switching, the RGB lighting feature is also accessible from the top row of function keys, including repeat rate and Windows key locking. While this holds no benefit to me I can see where it would be useful and it’s great to see. Providing up to 26-key anti-ghosting, serious gamers have clearly been part of the thought process, not to mention prodigy typers with a YOLO mentality. Highly reinforced with the assistance-feet for those who prefer to use their keyboards at an angle, the rubber grips make sure the keyboard isn’t going anywhere – reliable and rugged for a premium feel. The lack of a braided cable however is clearly a let-down. Why isn’t this a standard? The keyboard is bordering perfect and had the cable adopted this trait I would be sitting happy. But we’ve got bigger problems. I’ll always take issues with RGB backlighting, that’s never going to change. Whether it’s your M.2, your graphics card, your motherboard or mouse – I’m going to switch it off or dim it to the minimum on a singular colour. For this personal gripe alone I can’t fault the MasterKeys for including it. What I can fault it for and truth be told this is actually universal, is the absence of a warning label which no manufacturer has thought to be of importance – in regards to the effects of epilepsy and seizures which the product may induce. And this is something I find to be highly concerning, frankly, it’s mind-boggling as to how and why this is continuously overlooked by designers and manufacturers. It’s a keyboard that blinks, think about it. When all is said and done, the MasterKeys Lite L is a fantastic product. It feels mechanical yet is great on price thanks to the Mem-Chanical design. 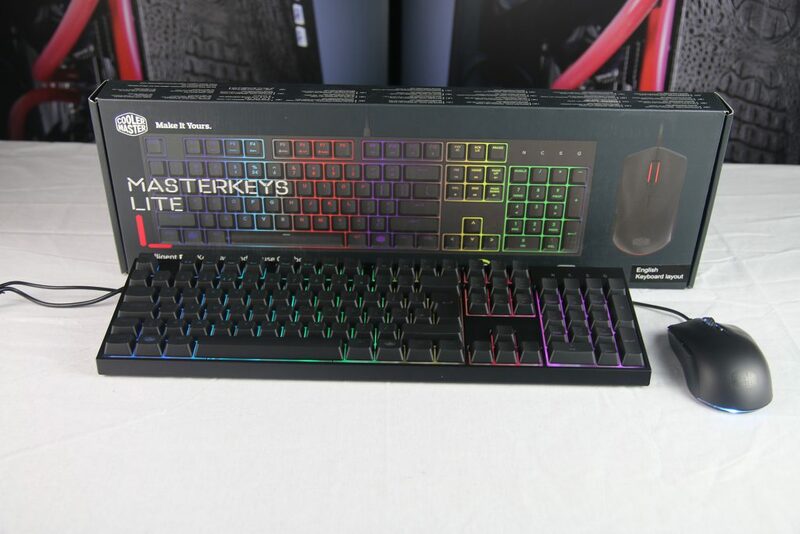 Available soon as part of a combo bundle the Cooler Master MasterKeys Lite L will be up for purchase at Dino PC. Check out our current range of Cooler Master Gear.